If you kitties have lived with humans for any length of time, you know they can sometimes be a challenge to cope with! They are willful creatures who often consider their own comfort before thinking about their cats’. They are unpredictable, occasionally loud and are known to eat really strange things. But even though they are quite a handful to manage, well-trained humans offer lots of rewards in playtime, treats and love. Here are five tips that will help you, my fellow felines, unlock the mysteries of human behavior — and keep you sane at the same time! Humans mistakenly believe that the word “No” will have an effect on our behavior. They use it whenever they disagree with some way we are behaving. You are welcome to ignore this word — or not. Sometimes it is fun to surprise them and stop whatever you are doing. Of course, this does not mean you have to do a repeat. You can always go back to ignoring. 2. Passive-aggressive behavior will get mixed results. Humans lack the ability to interpret subtle clues. So it may take them a while to figure out you are rusting that paper bag and making annoying noises because you are hungry. Usually, over time and after repeated, ignored “No’s,” they will figure it out, but you might want to consider a more direct approach, like walking to your food bowl and meowing loudly. 3. Humans do best following a routine, but you may have to teach them. Like cats, humans are creatures of habit. But there are times when their routines do not match yours. In these cases — usually revolving around snack or meal times — it is up to you to stick firmly to your schedule. If you are not consistent yourself, you will get inconsistent results. This is especially true when it comes to morning routines. Don’t let your humans sleep in if it does not work for you. Be strong and persistent. 4. Humans can have annoying ways of trying to impose their will on you, but there are workarounds. Do they pull out a spray bottle or speak in their loudest voice when you are trying to do something they don’t like? Perhaps your best tactic is to do it whenever they are not around to bother you. Yes, there is fun to be had in getting a rise out of them, but you also have to know when it’s just not worth it. Enjoying your most desired (and least human-liked) activities in their absence can help keep the peace. 5. Cuteness will overcome an amazing number of gaffes. Did you accidentally break an expensive vase? Leave claw marks on the leather couch? Steal the roast that was meant for the human’s dinner? Roll on your back and wiggle around! Make that irresistible little “prrt” meow! Give with the innocent tilted-head look! All cats have something that they do that makes their humans melt, and the best time to pull it out is when you’ve done something that those humans are less than pleased by. But don’t just wait for those nasty situations to pull out the Cute card. When you want something, such as a taste of whatever the human is eating, big eyes a little paw pat on the leg will work way better than just jumping on the table and trying to grab it. Cuteness is your secret weapon, and the best part is, it never gets old. 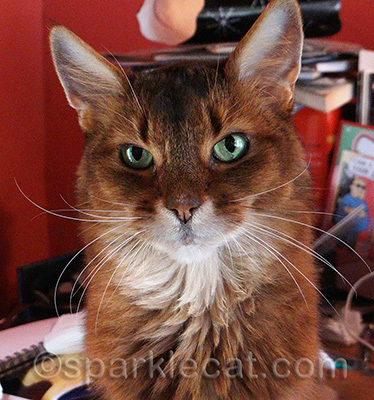 Kitties, do you have any more tips you would like to impart? We both have our own ways of getting round NO from our human. Lucy is great at doing a silent meow while looking pitiful – she always gets something tasty for that. Hannah is more persistent in her wishes for food by always standing where the human wants to be in the kitchen when she’s getting her own dinner – if she’s not fed something she just doesn’t move – if Mum moves her she just walks right back! Melly is a master of #5! Seriously, that little fuzzbutt is darn lucky to be so cute. Wise words, indeed. We are especially dumbfounded by the concept of the word NO. As if that could EVER apply to us. Pfft. Me must add the PRRRRRRR defense! When my Mommy does something me does not like, me likes to Yakks in her slippers or in the bedroom door. When she gets up in the middle of the night and gets squishy feet, and gets really mad, when she has cleaned up everything, me makes it a point of purring really loud and being especially cuddly! The day my Human pulls out a SPRAY BOTTLE is the day I pack my bags and hitchhike down the 5 to your place. A long time ago, my human’s boyfriend tried to spray Binga for some infraction or another… but she winced and looked so pathetic that he has never tried to do it since! I must say I fail in the early wakeup department. TW has been known to wake before me and have to call me. My favorite time to eat is at night. My tip would be, when the human says No, bite them. Then theyâ€™ll have something to really say No to. Thanks Sparkle! Now I think I have insight into why all the felines in our house are eye-rolling at me!!! These are excellent!! Number two is very telling to us! Humans are very weak when it comes to the cute! Excellent tips. I would show them to my little brother, Mickey Mouser…. but he can’t read. Excellent tips, Sparkle! You are so right, cuteness works so well. That’s how Ashton taught the peeps to feed us treats from the dining table. We are pretty good at #3. We will not let Mom sleep in . Cuteness works for us every single time! Cute always works on me. We can see the smarts in your eyes! MOL, no kidding! I was in a posing mood and my human didn’t have time to fix the background – she knew she was on borrowed time. 😎 Great tips Sparkle! Number 5 works particularly well if I rub around My Persons legs and give her a pitiful little “Meow.” I always get a treat! Selleck and His Person, Emily. Top tips, I bet the would work just as well for us dogs!! Great tips! No. 5 is a winner! Bravo Sparkle you hit the nail on the head w all 5! Those were great Sparkle! I do like to ignore as much as possible! Al very true. We are especially fond of #5, although we never do anything naughtyâ€¦. Great list! All kitties should follow it. Oh yes, work the cute! Always a good move. Those are great tips, Sparkle. The mom is always telling us “no more food” after we’ve eaten and are begging for more. But we are relentless…we won’t stop begging. And then she finally caves and gives us a little bit more. Heheheh. WE think that is a great list of things to watch out for from those humans. They do fly off the handle once is awhile. Just run and hide and then come out just purring and head butting. We hope you have a great day. Those are really good tips, Sparkle! We always nudge the Mom around meal time so she is sure not to forget when we are supposed to bed fed, MOL.